Content management tools, e-commerce, formatted e-mail newsletters, e-bidding, document sharing, and business process automation  all fully customized inside your working website. Your website needs a safe home. Heavy Duty Hosting™ includes firewall security, 99.95% uptime, and conveniences such as annual domain renewal, search engine registration, and detailed web traffic reports.  portable (Web & POP). 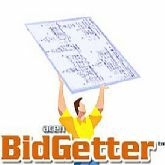 Add LockBox™ to Accept Bids Online. All Bids are encrypted till bidtime.